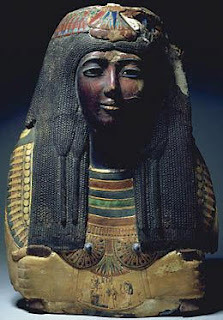 Around 1962 the Egyptian mummy mask excavated at Saqqara, and now in the St Louis Art Museum, is reported to have entered the Kaloterna collection. What is this collection? What else formed part of the collection? Where was the collection located? When did the owner of the Kaloterna collection sell the mask to a Croatian private collector? And how did the mask move? Do readers of LM know of other documented items from the Kaloterna collection? The Director, curators, and Trustees of SLAM need to explain the Kaloterna collection, not least because it coincides with a period when the mask is recorded as being in Cairo. What if the Kaloterna collection is a fictional collection?